Invivo is shaking up the wine industry again, returning to the market seeking up to $6.5m in new equity from existing shareholders and new investors to continue driving growth in their key markets. Note: The Invivo public offer has now closed. Our story began when the two of us got together in a bar in London to talk wine. How to make it better. How to cut through the fluff that the traditional wine companies seem to love so much. We always believed in the power of a strong brand so we decided then and there to build a business that let us create one, and have fun along the way. And you know what? It worked. Invivo continues to be one of New Zealand’s fastest-growing wine brands with 175% sales growth since 2015. It’s been a wild ride. We started off making 60,000 bottles right after the tumultuous 2008 harvest – which just happened to be in the middle of the GFC. 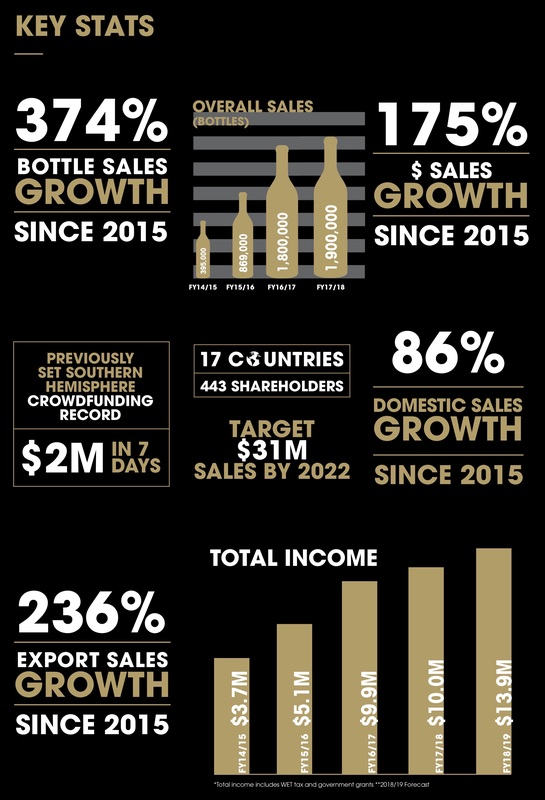 These days we’re a fully-fledged wine company selling over 3 million bottles in the year ended March 2018 (“FY 17/18”). We’ve built a community of 443 shareholders from NZ’s first winery equity crowdfunding round. We’ve collected a bunch of gongs, including World’s Best Sauvignon Blanc and in 2016 moved into one of New Zealand’s oldest wineries, where we continue to turn some of the world’s best grapes into New Zealand wine that’s picking up fans from Cork to New York. We’ve gone from standing in small bottle shops around the country and hand delivering our wines to people’s homes to being distributed around New Zealand by Lion and selling in some of the world’s largest retailers, including Tesco and Sainsbury’s (UK), Musgrave (Ireland), Woolworths (Australia) and Kroger (USA) to name a few. The wine industry is enormously competitive, but it is also huge, and we have always maintained that if we could offer the consumer a new and innovative approach to our products then we would have success. By focusing on our customers’ needs and on innovation, we have managed to grow our business rapidly. Three years ago we sought expansion capital through a newly established equity crowdfunding platform. This approach – apart from being highly successful – suited our business well, because at the core of our capital raise was a connection with our community and our supporters. We raised $2m in early 2015 and, with that investment, transformed our business. New systems, people and strategy were all implemented, and we went from around $3m turnover to $10m in three short years. We’ve gained listings with some large retailers around the world and we continue to gain traction and win new listings as our momentum continues. We’ve proven what we can do with a capital injection. With the company having grown so much larger, it’s now time to kick that momentum into another gear and drive Invivo forward for the next 3-5 years. We are seeking $6.5m in equity capital to further ramp up the work we’ve done and drive growth in our key markets, targeting $31m turnover by 2022. We have the talent and experience to execute our plans and the passion in our product and story. This next stage in the company’s life is an exciting one with the end goal being to deliver real financial benefit to Invivo’s shareholders. Driven by strong growth in our domestic market along with key export markets and successful NPD, sales have grown from $3.5m in FY2015 to $10m in FY2018. We expect this growth to continue as we look to achieve >$20m annual revenue in the next few years. We extended the Graham Norton brand, with positive uptake from the trade and great enthusiasm from Graham himself, with listings in Ireland, UK, Australia and New Zealand. Since November 2016 we have sold 705,000 bottles of the two new wines! Since the first sellout vintage in 2014, Graham’s wines are now sold in nine countries and have been awarded over 50 medals including gold at the Drinks Business Global Sauvignon Masters. US publications The Wine Advocate and Wine Spectator have both awarded Graham’s Sauvignon 90 points and the Graham Norton Sauvignon has been chosen to be served in Qantas Business class. The wines are sold in some of the world’s largest retailers including Tesco, Asda, Kroger, Woolworths and Musgrave. We are only one of a handful of crowdfunded companies to have had our accounts audited. This is a significant milestone for Invivo and the process has helped us refine our systems and processes to maximise our efficiency and information flow through to management. In October, 2017 we appointed Paul Schaafsma, former CEO of Accolade Wines to the Invivo board as an independent director. Under Paul’s leadership, the fifth largest wine company in the world exceeded AUD$1billion in revenue with a team of 1700 employees across Australia, New Zealand, UK, China, Japan, South East Asia, USA, Chile, Canada and South Africa. His work in the industry culminated in Paul being awarded “Man of the Year” by Drinks Business magazine in 2015. Our focus market export strategy is delivering positive sales growth. These focus markets are Australia, UK, USA, Japan and Ireland and are all working well. Invivo actively invests marketing spend and time in these countries each year. We are working hard to grow these even further. We moved into the historic Te Kauwhata winery in February 2016. The winery was first designed and constructed by the New Zealand government in 1902 as New Zealand’s first viticulture research station. The winery was originally headed by industry pioneer and viticulturist Romeo Bragato. With our own bottling line that can run up to 10,000 bottles a day, we have seen significant cost savings from running the winery. Also in 2016, Invivo opened an Australian office based in South Australia. The office is run by international sales manager Mark Boardman. We partnered with TV personality Paul Henry to launch a Pinot Noir in 2016. Like Graham, Paul was involved in the blending process to select his style of Pinot Noir and we released a film. We received significant media coverage around the launch and the wine sold out in hours. Glengarry’s General Manager billed it as their ‘most successful launch of an individual wine ever.’ In fact, it went so well, we announced a second release in 2017. The wine was included in Michael Cooper’s round-up of the best New Zealand Pinot Noirs under $30. Love or loathe Paul Henry, it worked! Invivo’s unique approach has meant we were featured in hundreds of articles worth millions of dollars of coverage across the world yet still working on a shoestring marketing budget compared to our larger competitors. 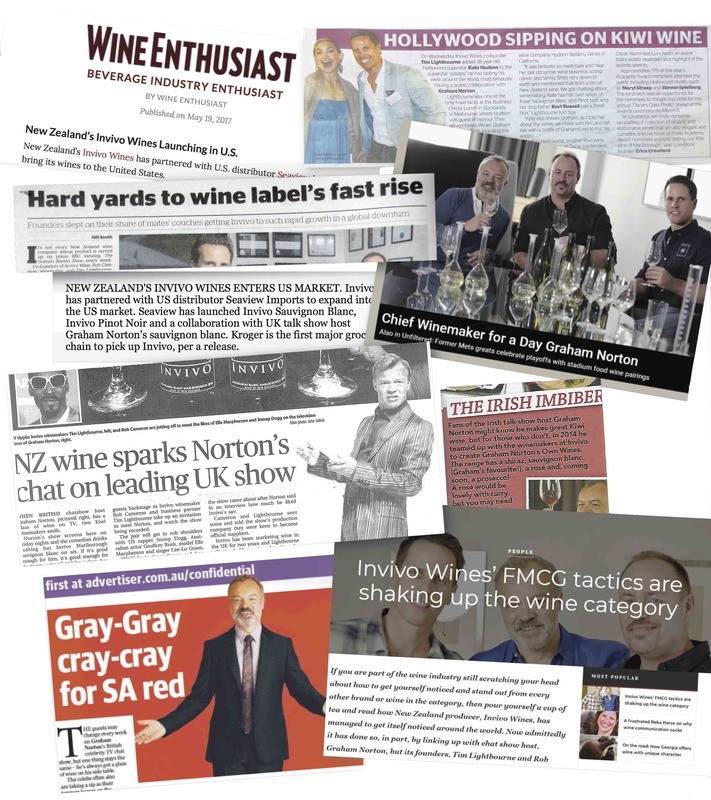 We’ve been one of the most talked about New Zealand wineries in global media. Highlights included being featured in the New York Post, Daily Mail, The Sun, Sydney Morning Herald, The UK Times and numerous times in local outlets the New Zealand Herald and Stuff.co.nz. As part of the successful range extension with Graham Norton wines, we are now working with growers and wineries from Australia to produce Graham Norton’s Own Shiraz and Italy to produce Graham Norton’s Own Prosecco. Our unique story has been published in over 190 press articles in the last 12 months - worth $3m in coverage.